As a B2B marketing professional, I understand the challenges of connecting with the often-elusive B2B buyers. With so many digital marketing channels available for marketing professionals, developing an online presence can be overwhelming. #1. Build your presentation with a long-term vision. 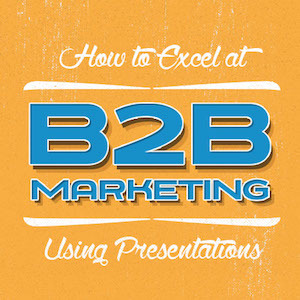 Presentations that will be used for B2B marketing are different from presentations that will be delivered by a speaker. For example, since your presentation will be viewed online, your deck needs to convey a complete message that does not require explanatory comments from a presenter. The Ethos3 presentation How To Lead With Your Presentation is an example of a deck that can stand alone, without additional explanation from a speaker. While your presentation should be able to communicate a message without the assistance of a speaker, you can also use your call-to-action at the end of your presentation to direct viewers to one of your resources that expounds upon the message of your deck. When outlining your presentation for B2B marketing purposes, make every slide count. According to a 2014 DemandGen report, 86% of B2B buyers expressed some level of desire to access interactive/visual content. Because the majority of B2B buyers desire visual content, marketers need a large collection of high-quality visuals for every online marketing campaign. However, creating a collection of professional visuals requires time and talent that most marketers typically do not have. To make every slide count, include a complete thought, interesting stat, or compelling quote on every slide. You likely will not be able to accomplish this for every single slide on your deck, and that is okay. However, you should aim to communicate a meaningful message on as many slides as possible to get the highest ROI for your presentation. By making every slide count in your B2B marketing presentation, you can dramatically increase the number of visual assets that you can utilize across a variety of digital platforms. Each slide has the potential to become a visual asset that you can use independent of the other slides in the deck. Once you design your presentation, put it to work for you on social media. Most people know that social media is a critical component of B2C marketing campaigns; however, social media is also critical to the success of B2B businesses. For example, according to The 2015 B2B Buyer's Survey Report, 53% of B2B buyers said that social media played a role in their assessment of various tools and technologies. The 2015 B2B Buyer's Survey Report also reports that more than half of respondents said that LinkedIn (61%) and blogs (58%) were important resources during their initial learning process, followed by YouTube/Vimeo, Facebook, Google+ and Twitter. Across all of these channels you can use your B2B marketing presentation in a variety of different ways. #3. Share the full scoop. Sharing your complete presentation on social media is simple. First, upload your deck to SlideShare. This step alone will work wonders for your credibility and exposure. According to CMO.com, in Q4 of 2013, SlideShare averaged 60 million unique visitors a month and 215 million page views. CMO.com also noted that SlideShare receives 500 percent more traffic from business owners than Facebook, Twitter, YouTube, and LinkedIn. With so much quality traffic landing on the site, it is easy to see how businesses can easily benefit from marketing on SlideShare. For example, Frost & Sullivan gained thousands of qualified leads a year, and a 50x return on investment by using SlideShare. Next, embed the presentation on your LinkedIn profile as well as in your LinkedIn blog posts. 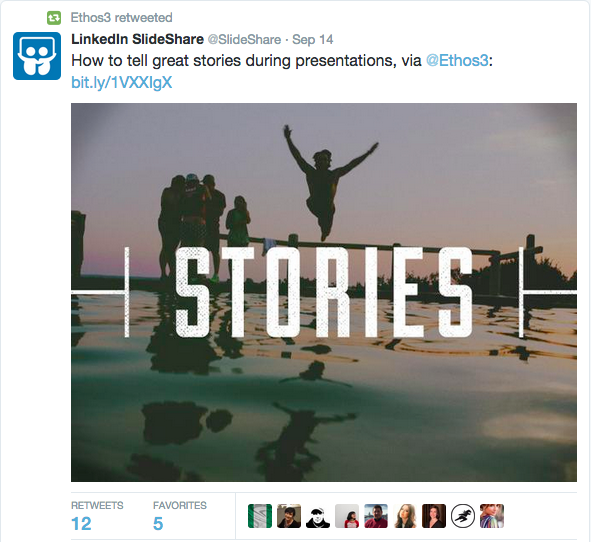 To see what it looks like to embed a SlideShare presentation in a LinkedIn post, check out 3 Storytelling Tips - From Acclaimed Writer Burt Helm. Since blogs are listed as one of the top resources for B2B buyers, it is worth mentioning that you can also embed your SlideShare presentations in blog posts on your website. 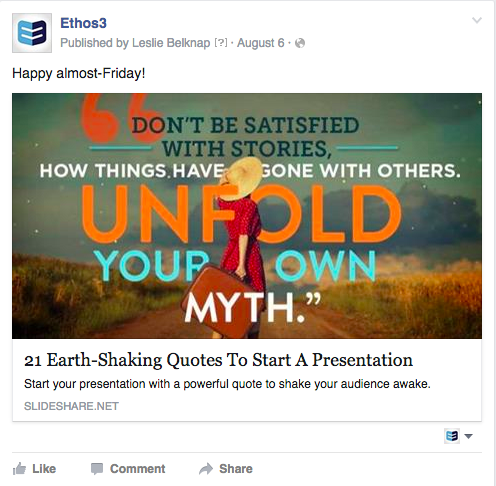 See an example in the Ethos3 blog post, How To Create Presentations That Stick. To share your complete presentation on Twitter, simply copy and paste the URL for your presentation into your tweet. Check out the tweet below to see how users can view all of your slides within their Twitter feed without leaving the Twitter platform. Uploading your deck to Pinterest requires only a few clicks and is a nice addition to any Pinterest board as you can see in this pin. To share your presentation on YouTube and Vimeo, convert your deck into a video. By converting your presentation into a video, you can also easily upload your complete presentation to Facebook. Sharing your slides is the secret to transforming your presentation into a marketing powerhouse. If you followed the tips outlined in steps #1 and #2, the next step is to save your slides as JPGs in PowerPoint so you can start sharing. Since all of the major social media platforms accept and encourage images, adding JPG versions of your slides to posts should be second nature to you at this point. 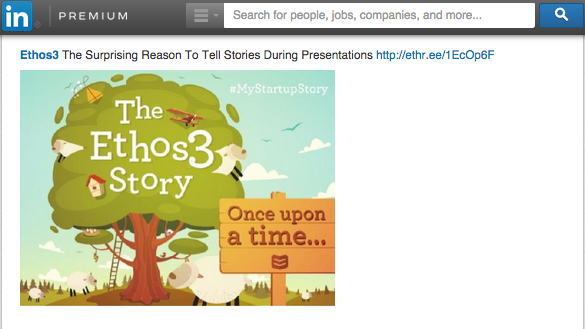 Sharing your SlideShare presentation should not stop at social media. You can use your deck for a webinar. After all, 67% of B2B buyers use webinars to research purchases. In addition, event marketing has been listed as one of the top marketing tactics for B2B businesses. If you plan to take advantage of the opportunities awarded to event marketers, bring your presentation with you to the event. You can share it with new contacts by displaying your slides on a screen in your booth, or by sharing it on a mobile device that you carry with you. 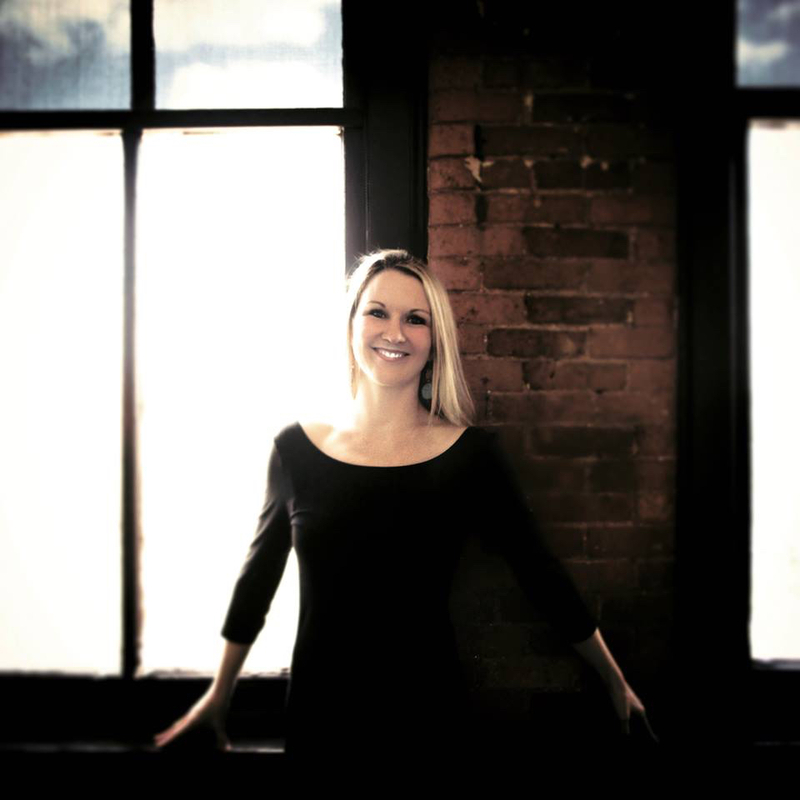 Leslie Belknap is the Senior Content Strategist for Ethos3, as well as a board member and speakers’ coach for TEDxNashville. Say hi to Leslie onTwitter; she manages tweets for Ethos3.